The Heinz ketchup bottle has become a mainstay of family dinners and greasy diners alike, and it's for this precise reason that its iconic shape so often goes overlooked. The ketchup bottle's familiar glass frame comes with a rich, fascinating history that, fortunately for us, Co.Design has been kind enough to dig up. If there was one principle that Henry J. Heinz valued more than any other, it was purity and transparency. "It is always safe to buy the products of an establishment that keeps its doors open," Heinz once famously wrote. That every bottle of Heinz Tomato Ketchup sold is see-through is no accident. It’s a design statement: purity through transparency. Each bottle of Heinz ketchup somewhat mysteriously brags about the company’s "57 Varieties" in a small label wrapped around the neck. That there are actually 57 varieties of Heinz products has literally never been true. Inspired by an advertisement he saw on a train for a company that made "21 varieties" of shoes, Heinz combined his favorite number, 5, with his wife’s number, 7, to brag about his company’s own breadth of products. When he first began to put the "57 Varieties" label on his ketchup bottles, the H.J. Heinz Company already produced over 60 different products. But despite common opinion, the bottom of a bottle of Heinz Ketchup isn’t actually the best place to thump it. If you apply force to the bottom of a bottle of Heinz, the ketchup closest to where you smacked will absorb most of the force of impact. It will flow freely, but the ketchup that is viscously clogging the neck and mouth of the bottle won’t, leaving you no better off than you were before. 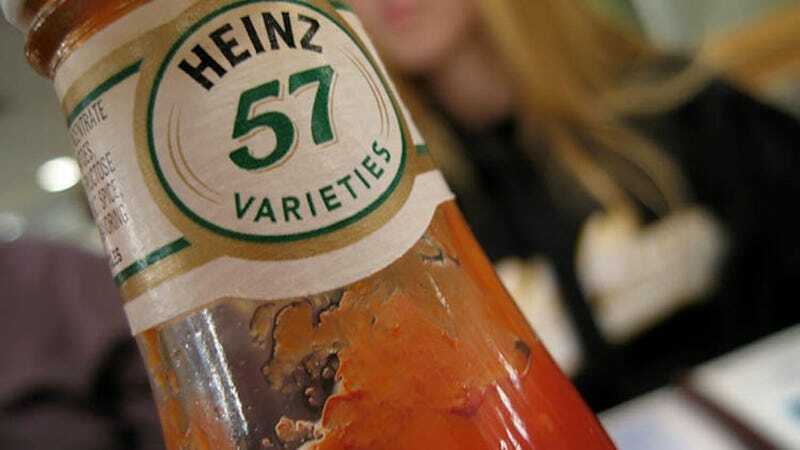 So while the substance of Heinz’s "57 Varieties" label may be just a fanciful whim on the part of the company’s creator, its positioning is deliberate. It’s a target. By simply tapping the label with two fingers, you create the optimal conditions for shear thinning, transforming non-Newtonian ketchup into a free-flowing liquid. Physics!